Lazies, Join me as I share some of my top tips for choosing zippers for my projects. 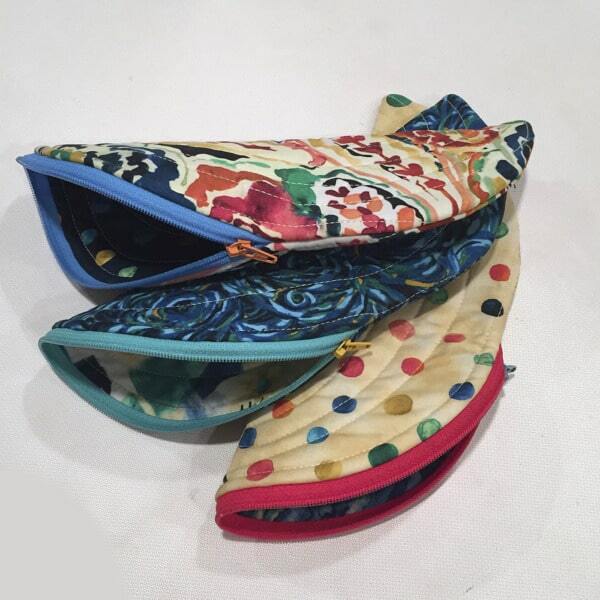 Our little Banana Bag LGD143 looks great dressed in all sorts of yummy fabrics. 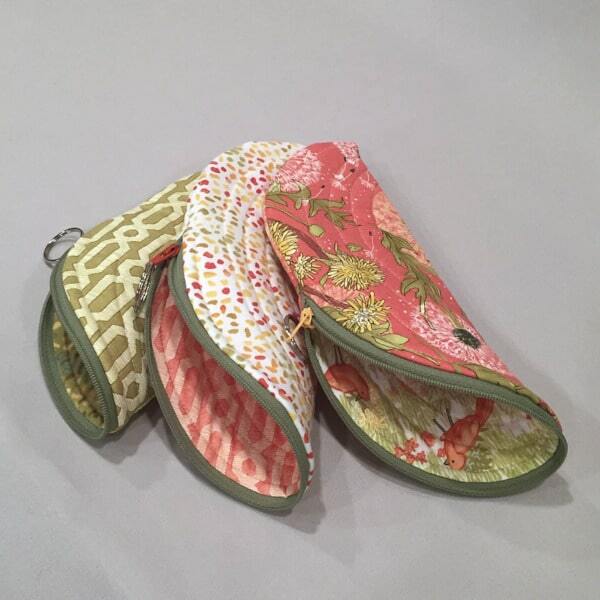 Let’s explore my strategies for choosing a zipper color for each of these Banana Bag projects, then use these top tips on your next zippered project. Pin this image to save this idea to you Pinterest boards. 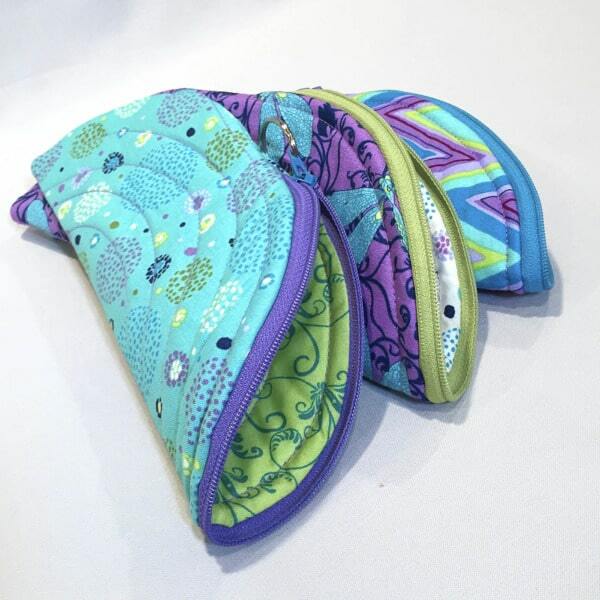 Zippers are part of the ‘fabric’ of your sewing projects and are more than just a functional closure. Zippers are exposed, bringing a color and visual texture to your sewing projects. 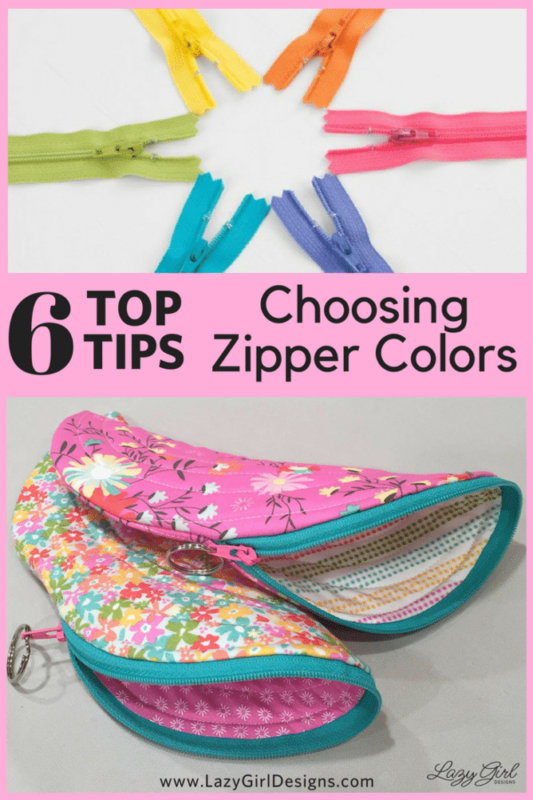 Here are my top tips and strategies for selecting a zipper color for sewing projects. Oh my, you just can’t beat a fantastic pink with teal accents. This pink gets me. It speaks to my inner happiness and makes me smile. 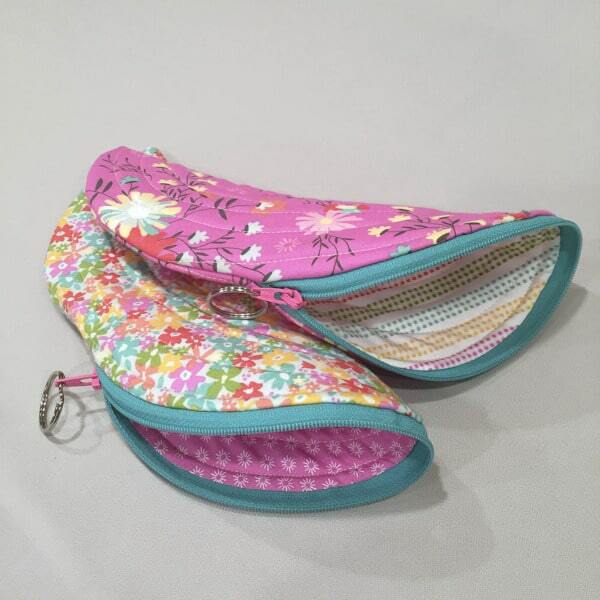 The transition to a vibrant teal zip on these Banana Bags anchors the pink while letting it shine at the same time. It looks like the zipper is smiling, too. While these fabrics are bright and beautiful, they can feel soft at the edges. Look at the curved ends of the bags, away from the zipper. Visually, the edges of the project are less strong than the edges with the zippers. These juicy fabrics are ‘Sunnyside Up’ by Corey Yoder for Moda. Fabrics are ‘Sunnyside Up’ by Corey Yoder for Moda. I adore purple, going all the way back to kindergarten when I only colored with my orange and purple crayons. 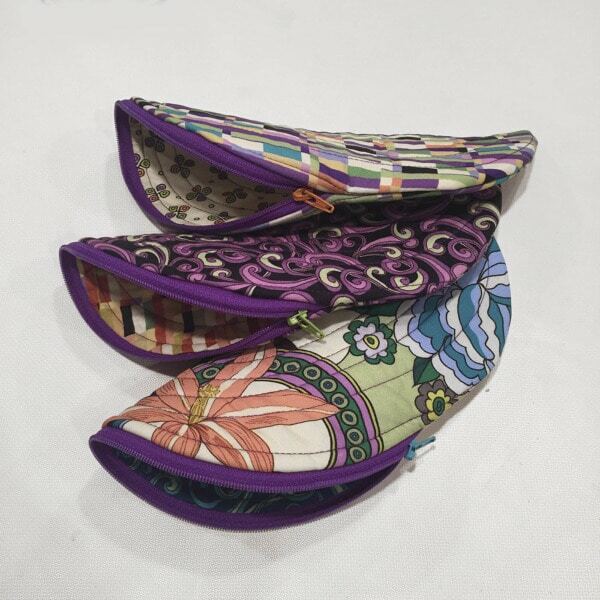 On this set of Banana Bags, I selected rich purple zips to reinforce the purple accents in the color story of the ‘Echo’ fabric collection for QT Fabrics. These large prints can scatter a color here, there, or everywhere on a small project like this. A purple zip helps anchor this color story and tie it all together. These wonderful purple-y fabrics are ‘Echo’ for QT Fabrics. Oh great plaid-y goodness, how I love thee! 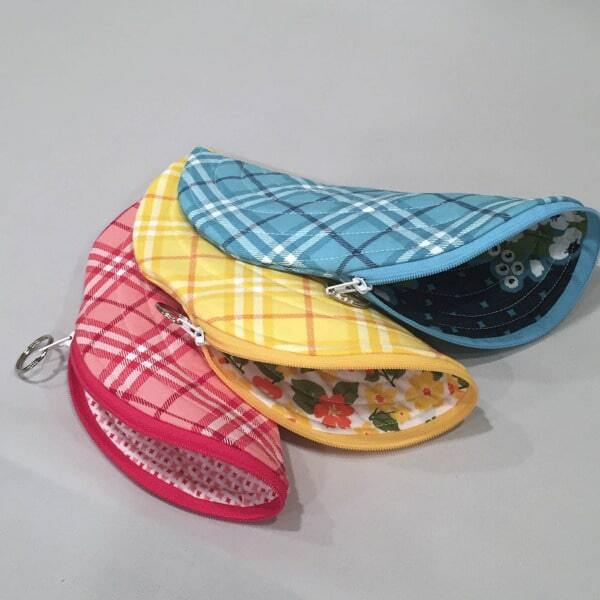 These plaids from ‘All Weather Friend’ by April Rosenthal for Moda are perfect on the Banana Bag. Because I used a plaid on point (can it be on point on a curved project? ), I chose zips that coordinated to support the color story rather than compete or compliment. White zipper pulls are a subtle choice to support the plaid as well. Zips aren’t just zips, they are as important as the fabrics. Audition different options just like you do for fabrics. These fun fabrics are ‘All Weather Friend’ by April Rosenthal for Moda. When picking amazing fabrics for your next zipper project, keep in mind that you’ll see the lining, zipper, and outside fabrics when your new brilliant creation is unzipped.. The zipper is the great divide, like sashing between quilt blocks or a belt on a dress. Use this divide as permission to go wild and pair fabrics with different dynamic moods. It’s okay, the zip is the guardrail keeping you safe. Even though the two fabrics in the bag to the far right below are different in color, but similar is scale, they could feel visually murky next to each other. The green zipper acts as a dividing line for both fabrics, offering a resting point or border for each. Fabric is ‘Dandi-Annie’ by Robin Pickens for Moda. These lovelies are ‘Dandi-Annie’ by Robin Pickens for Moda. When making a group of projects that are meant to be used together, look for harmony between the zipper colors and the fabrics. Choose a different colored zip for each item, or a single color and use for all items. This example shows three different colors that coordinate with the fabrics and have a similar tone or personality. Each zip has similar visual strength. These beauties are ‘Hayden’ from QT Fabrics. What to do, what to do, what to do? This fabric collection has both abstract prints and geometric prints. If there isn’t a clear direction for choosing zipper colors, or you simply cannot decide, don’t worry about – just go sew. There may not be a strong approach for a collection like this. All of the fabrics go together. Pick two fabrics, audition some zip colors, then just go sew and make something. You are over-thinking it. Take a breath, then give yourself a break and go make. These fun prints are ‘Delia’ from QT Fabrics. Our model for this post is our Banana Bag LGD143. The pattern is available as a PDF download here, or as a printed pattern from your favorite quilt shop. Note: This post contains an Awin/Etsy affiliate link. I make a commission when you order items through that link. All zippers shown are YKK brand size #3. 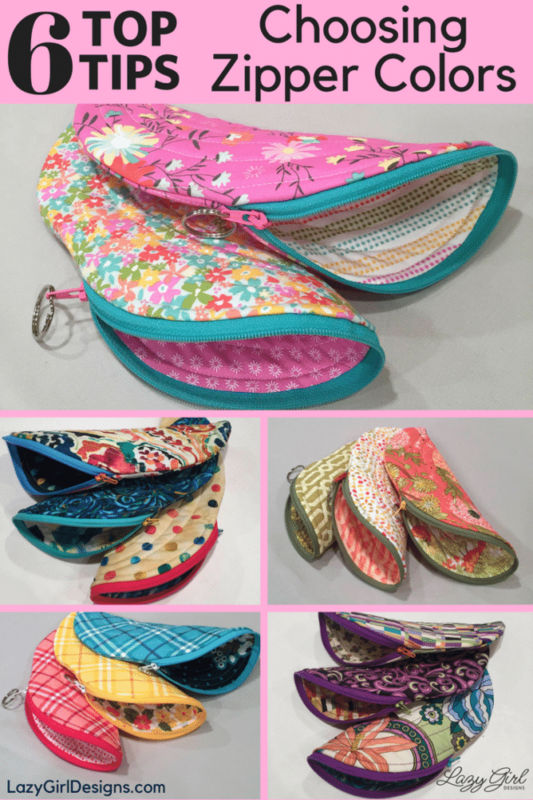 The Banana Bag pattern uses my One-Zip technique to cut apart a standard zipper, create a loop style zipper, and my trick for swapping the zipper pull color. Directions are in the pattern. Check with the manufacturers for availability for all of the fabrics shown. Next Post » Shrinkage: Don’t Get Fleeced On Your Next Bag Project! I have some vinyl animal skin looking prints that have a smooth inside. I would like to make the Becca bag for my girls at work for Christmas. Do you think this would be too thick to use? These will be my first bags to make. Carol, Congrats on getting started with your first bag! 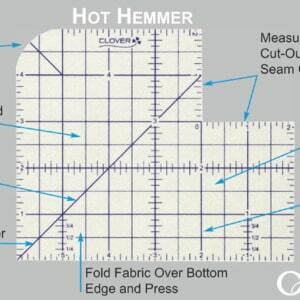 My best recommendation is to always make the pattern as directed, including fabric recommendations, so you know what to expect and get a feel for how to adjust – that includes fabric adjustments such as working with Vinyl. Overall, I would wait to try a vinyl fabric until you have some bag-making experience simply because working with vinyl has its challenges and I worry you might have some issues that leave you feeling unhappy with the project. I’ve had bad project experiences and they can be hard to overcome. When you are ready to try vinyl, do some research about: presser foot, stitch length, and pinning. I have some pretty quilted material that I would like to use for this project. Would it work? Hi Cathy, You could certainly use quilted material. Skip the lining fabric. Your seams at the zipper will be exposed. Do you have a multiple zipper crossbody lined tote pattern?